High Speed Dock to VGA Adapter are premium quality cables that help you extract the maximum performance from your gaming or home theater setup. With this Dock Connector to VGA Adapter, you can connect your Apple iPad to a TV, projector or VGA display and watch videos and slideshows on the big screen with family and friends. Then see your videos and slideshows on the big screen. What a harmonious and intoxicating picture! A perfect item for Apple iPad/iPad 2 3, 100% Brand new and high quality. 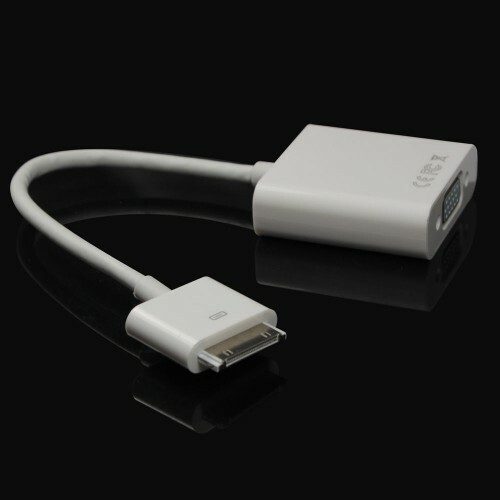 Compatible with Apple iPad, iPad 2, iPhone 4 4s. Just plug and play, easy to use. Just connects to your iPad or iPad Dock via the dock connector. Then connects to your projector or display using the VGA adapter. 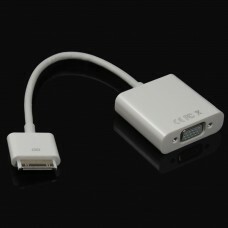 Excellent design for connecting your iPad to an advanced digital monitor, such as the LCD Display, Monitors, Projectors. Display and share your videos and slideshows on the big screen with your family and friends. Note: This cable is not sufficient to connect to a display by itself. You will need to use a VGA Male to Male cable to connect to your display (Not included).